For our visitors comfort all of our rooms are air conditioned. To be as accommodating as possible to people with mobility problems, all our rooms are ground floor access. Every room has free cable TV. The rooms come with tea/coffee making facilities but for a delicious breakfast or dinner avail yourself of Moos Restaurant. Don't forget that we also have room service available. Most rooms have sitting room or balcony that overlook the city of Grafton, the mighty Clarence River and the picturesque rural countryside. 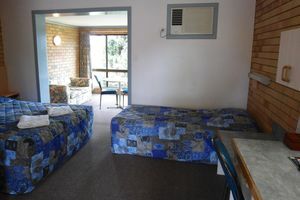 Spacious family rooms sleeps up to 7 people..
We also provide free wireless internet .